The International Brotherhood of Magicians Ring 160 Kiwi Magic, the Tony Wilson Ring Inc.
My name is Stan Goudge; I represent the Brotherhood of Auckland Magicians Inc; the International Brotherhood of Magicians Ring 160 Kiwi Magic, the Tony Wilson Ring; and the magicians of New Zealand. 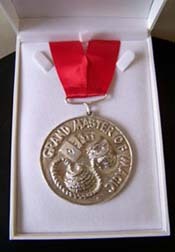 It is my privilege today to present a Grand Master of Magic Award. It is New Zealand's premiere magic award and it will be only the thirteenth presented since 1969, thirty seven years ago. The new recipient stands in exalted company with Edgar the Great Benyon, Jack Read, Jon and Janet Zealando, Jim Reilly, Harold Chandler, Francis Newmarch, Peter and Phillipa Evans, Tony Wilson, Graham Grant, Barry Brook, Bernard Reid, Burns Scandrett, and Wayne Rogers. Some of our Grand Masters are here tonight - Please stand, Grand Masters of Magic. Your ranks will now include another who has made an outstanding contribution to magic over many years. Ladies and Gentlemen please acknowledge a new Grand Master of Magic - Alan Watson. Alan Watson has a lifetime interest in the art and craft of magic, inherited perhaps in his genes from his great Uncle Oswald Ashton, who performed during the First World War, and was one of the eight founding members of the New Zealand Society of Magicians in 1920. As I recall it, I first met Alan in 1978 when he joined the Brotherhood of Auckland Magicians, and it soon became obvious that he was most serious about developing a career in magic. His background in sales and marketing was of great assistance and he has made great use of the media for advertising and promotion. Alan is a good all round magician having mastered the major branches of our craft. Close Up, Strolling, Children, Family, Stage, Corporate, Restaurant, Trade Show, Birthday Parties, Theme Park, Shopping Malls, and Mentalism. They have all been successfully employed with the distinctive Alan Watson touch. Alan is perhaps New Zealand's busiest and most successful professional magical entertainer, he is never out of work, and knows that show business is a business that requires promotional and administrative skills as well as magical know how. He has been successful in competitions at Magic Conventions both here and in Australia, has travelled extensively and is well known in the magic community worldwide. For 5 years Alan was resident close-up magician at the renowned Fisherman's Wharf restaurant. He has been the resident magician with his Family Stage Show at Rainbows End theme park for 21 years. Of great importance to Alan is the involvement of his family in the Magical Watson Family. Wife Michele, daughters Nicole, Larissa, Melanie and granddaughter Aleshia, perform regularly together. Michele is a magical assistant and a performer in her own right, as well as an excellent balloon modeller. Alan and Michele in 2002 were presented the prestigious international DRAGON Award for a lifetime achievement by a couple in Magic. The word DRAGON acknowledges skills in Drama, Romance, Artistry, Glamour,Originality, and Necromancy. Member of The Magic Circle England, and Member of the Inner Magic Circle with Gold Star and The Magic Circle Representative for New Zealand. From The Variety Artists Club of New Zealand - a Benny for Top Magician four times, and the Agnew Excellence Award for dedication, professionalism and achievements in magic. Performer at The Magic Castle Hollywood, with over 100 shows in the Close-up Gallery and Parlour of Prestidigitation at this world famous venue. Life Member and member of the Order of Merlin with 25 years of continuous membership in the International Brotherhood of Magicians and a Presidential Citation for his contribution to the advancement of the art of magic. Past-President of the New Zealand Ring 160. Past-President of the New Zealand Society of Magicians. I would like to especially mention two outstanding contributions Alan Watson has made to magic in New Zealand, contributions that have benefited most of us here today. First: Bringing overseas lecturers to New Zealand. Over the years, he has helped to organize more than sixty lecture tours in this country from leading international magicians. These lectures have exposed local performers to international artists and have helped to raise the standard of the magic in New Zealand. Second: Alan is an expert at the computer, and constantly keeps up with the leading technology. He co-founded the MagicNZ Bulletin Board in the early 1990s, introducing New Zealand magicians to the Internet and starting the first magic bulletin board in the world. Today he edits a weekly Internet Newsletter called Magic New Zealand e-zine, which is read weekly by over 11,000 magicians, in 78 countries. Both those tasks take many hours of time and expertise, for which we are all very grateful Alan. Alan has a passion for assisting junior magicians and developing their skills. He also has a pet hate of magic exposure and jealously guards the secrets of our craft. Its purpose is to honour those magicians who are acknowledged by their fellow magicians to be masters of the art and craft of magic. The recipients first and foremost must be magical performers of a high standard. In addition they might be originators of magical effects, or administrators giving time and expertise to running societies and conventions. They could be consistent competition winners, or have an international standing, or be known only in the New Zealand setting. But above all they are people who have served magic well, have graced our art, and made a special contribution over many years. To this proud tradition you now belong. Congratulations. Tony Wilson Past-President of the International Brotherhood of Magicians, current President of IBM Ring 160 and Past-President of the Brotherhood of Auckland Magicians' will made the presentation of the Grand Master Medallion to Alan Watson; and Mary Wilson will present flowers to Michele Watson, acknowledging Michele's expertise and her support of Alan down the years. Dear Alan What a great performance you put on last night at the Variety Artists Club. I was totally mesmerized along with the entire audience. I can see why you are so well respected by your international peers and considered a Master of Magic. "In my eyes you are New Zealand's greatest magician". To whom it may concern, Alan Watson is the first magician from New Zealand to appear in our Close-Up Gallery. He delighted our audiences with his unique technical skills. They are at once astonished and well pleased, a rare combination for any professional to master. His act is of the highest quality and he is one of the finest talents to appear at the Magic Castle in a long time. We look forward to booking Alan Watson whenever he is in the area. Congratulations and sincere thanks to you for your very professional and entertaining performances at the Hunters Plaza during the school holidays. We are delighted with the public and retailer response to your shows, and I believe that you have hit the mark with what Shopping Centre entertainment. Entertaining children and adults at the same time is a hard thing to do, and yet you do it so well. From a Marketing Manager's point of view, I must say that it is refreshing to have a totally competent and professional team running the show.